We’re wrapping up the month of May with another edition of No Borders – a party series focused on expanding club sounds. Coming to play is the Mexican duo Zombies In Miami with support from local finest – Jorgos, Motch & Losko. 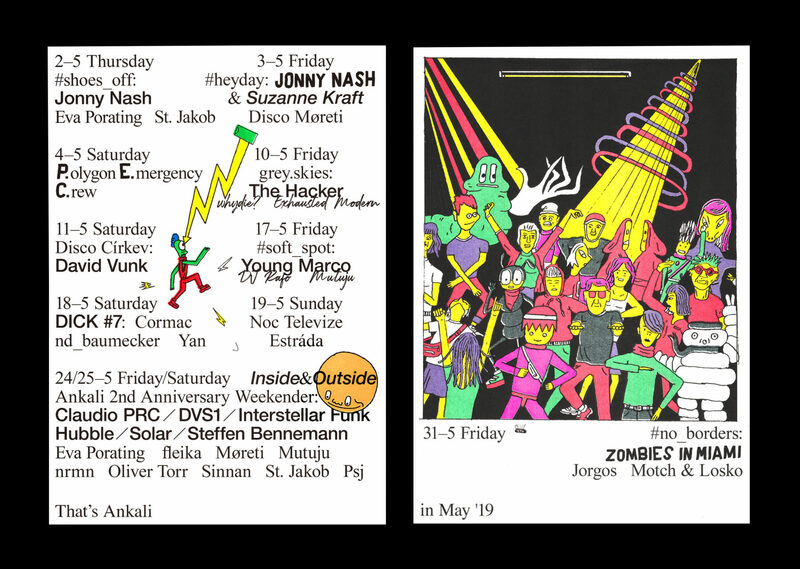 Zombies In Miami debuted in 2011 on the label Electrique Music and since then produced more than a dozen of records for such labels as Paramida’s Love On The Rocks, Correspondant (run by Jennifer Cardini) or the beloved Dutch imprint Bordello A Parigi. Their sound takes cues from classic House and Disco, but the duo give it a unique twist in the post-Kraftwerk DFA-records manner with heavy presence of live synth work and modulations. While ZIM often play live sets, in Ankali they will showcase their influences and gems off their record collection in a DJ set. Also on the bill are two djs affiliated with the favourite summer hangout cargo ship Altenburg – Motch & Losko. Wrapping up the lineup is our favourite recurring character Jorgos.